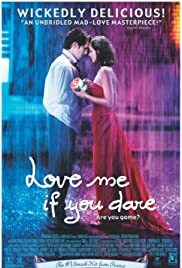 Shocking: Is Befikre inspired by French film Love Me If You Dare? Sophie Kowalski: Don't say a word. Let me talk. You missed me? Because I missed you. You're a real tyrant. It's so hard to be mad at you. But don't kid yourself, I still am. I want to talk and forget the game, just for once. Like my dress? I hesitated. Nabbed it off my sister. She has another red one, like a thermonuclear bombshell... That's the one I should've worn. I must've spent... three hours in front of the mirror. But I got there, see? I'm pretty. You better like it, or I'll kill you! Q: How did they get out of the cement block ? It will make you gasp, laugh, cry, scream, sing, and love. This is the greatest comedic love story I've ever seen on the silver screen. You will never forget this movie, from its playful beginning to its OMG-what-just-happened ending. For those of you who don't speak French, you do not need subtitles to understand the beauty, the depth, and the tragically hilarious love affair of Julien and Sophie. The movie will take you to every extreme of human emotion and leave you completely breathless with its UNBELIEVABLE ending. I was so entranced by the film that I sat there through the entire end credits, hoping for just a little more. This is a movie you cannot miss...it is one of the greatest films to be made in France. Watch it....I dare you. Are you game or not?